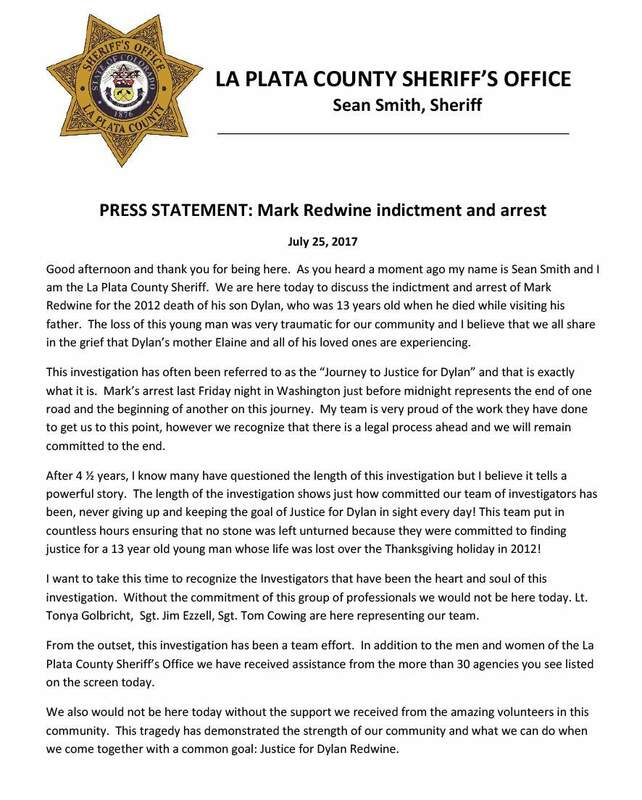 Sheriff Sean Smith discusses the investigation into Mark Redwine, who has been indicted on charges of second-degree murder and child abuse resulting in death of his son Dylan. Smith and 6th Judicial District Attorney Christian Champagne, right, told members of the media Tuesday that they feel they have enough evidence to successfully prosecute Redwine. “It’s time for justice,” Champagne said. 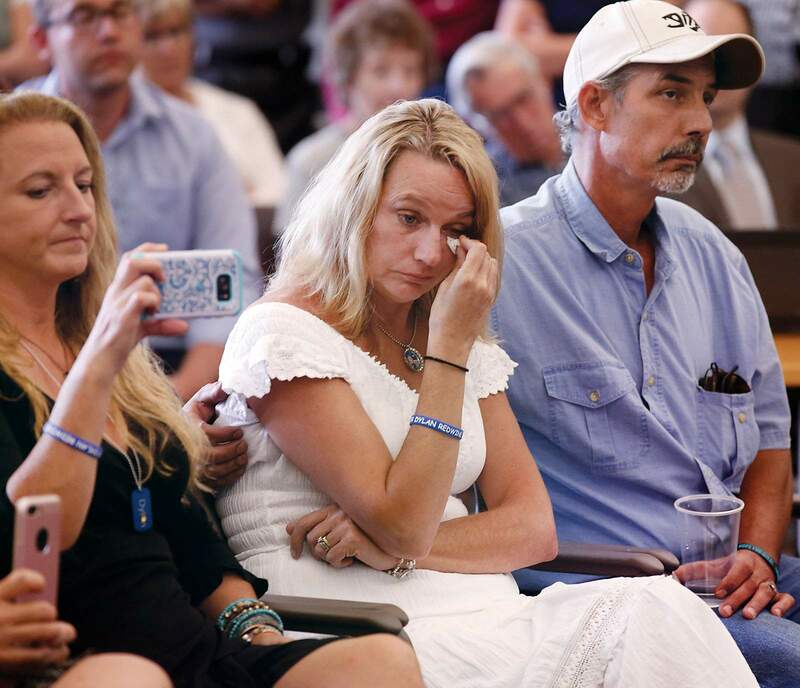 Elaine Hall, mother of Dylan Redwine, attends the news conference Tuesday. Hall held a brief conference of her own afterward. “I’m not worried about the time frame. I’m grateful that we were able to put a case together that the grand jury felt was worthy of an indictment,” she said. 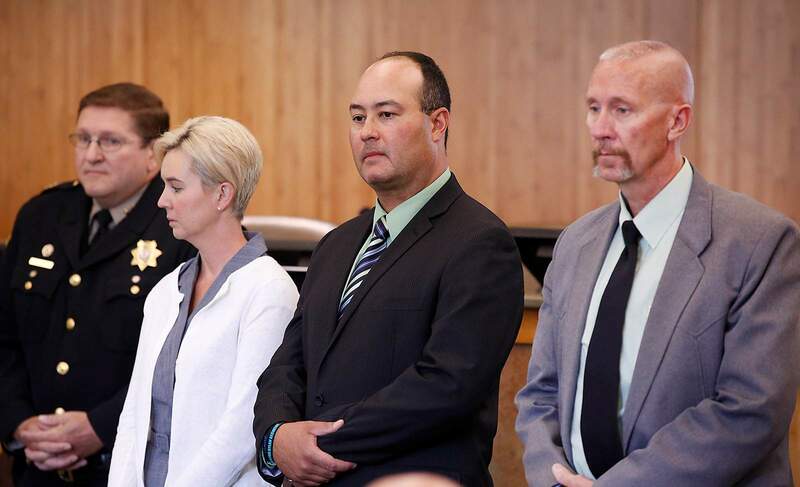 La Plata County Sheriff Sean Smith, left, stands with his investigators, Tonya Golbricht, Tom Cowing and Jim Ezzell, during a news conference Tuesday at the La Plata County Administration Building to discuss the indictment and arrest of Mark Redwine, who is accused of killing his son, Dylan, in 2012. 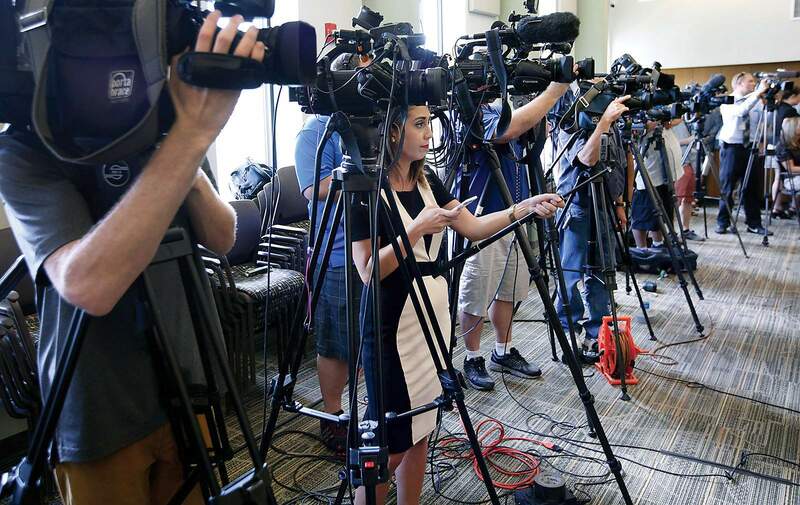 At least 10 television news cameras attended a news conference Tuesday at the La Plata County Administration Building to discuss the indictment and arrest of Mark Redwine, who is accused of killing his son Dylan. A video frame grab shows Mark Redwine in the back of a police car during his arrest late Friday or early Saturday in Washington. Three La Plata County Sheriff’s investigators were on their way to intercept Mark Redwine’s truck late Friday or early Saturday as it drove through Washington state to New York. But unexpectedly, Redwine’s rig was turned around at a weigh station for being overweight – not an uncommon situation for truckers. He was forced to return to Bellingham, Washington, where his trailer would be reloaded. 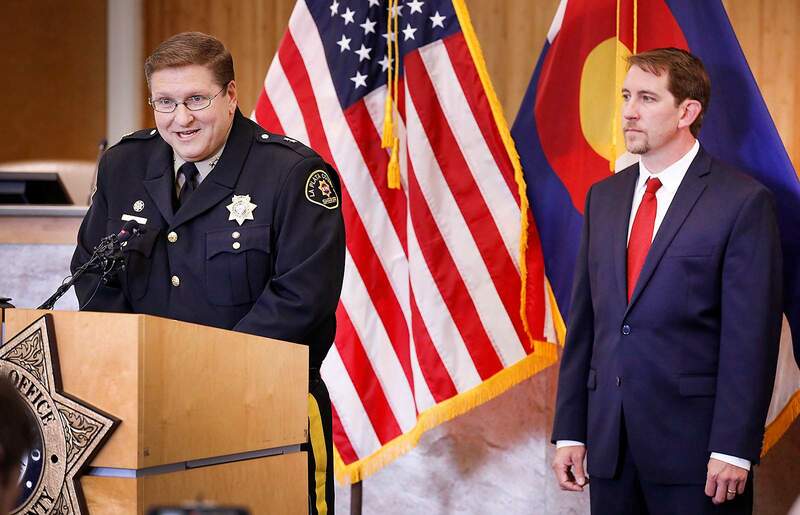 “Because of the turnaround of his truck being overweight, they (investigators) were out of position by about six hours in order to assist directly in that (arrest),” La Plata County Sheriff Sean Smith said Tuesday at a news conference held in Durango to discuss the indictment and arrest of Redwine, who is suspected of killing his 13-year-old son, Dylan, in November 2012. By the time investigators arrived, Redwine had exercised his right to speak to an attorney, preventing investigators from questioning him. Body cameras worn by Bellingham police show Redwine stepping out of his semi and lying on the ground. After officers read him his Miranda rights, a sergeant informs Redwine he is being held in connection with an arrest warrant from Colorado accusing him of second-degree murder. “I have no idea what that’s about,” Redwine says. Investigators named Redwine a person of interest almost two years ago, but he has denied any wrongdoing. He wore a red T-shirt, shorts, Nike flip-fops, glasses and had a Bluetooth device in his right ear. A trainee named Ricardo was in the passenger seat of the truck. Ricardo told police he knew Redwine had a deceased son, but he didn’t know Redwine was a suspect in the boy’s death. “He’s a good dude,” Ricardo told police. In an interview Tuesday, Dylan’s mother, Elaine Hall, said she’s no longer surprised by what her ex-husband says. She wanted Tuesday to be about her son. Smith and 6th Judicial District Attorney Christian Champagne confronted questions about why it took 4½ years to indict and arrest Redwine in connection with his son’s death. It has been a repeated question from friends and community members who have watched the case closely. Champagne confirmed he plans to file formal charges of second-degree murder and child abuse resulting in death. According to state statute, Redwine faces 16 to 48 years in prison if convicted of either charge. Smith said “no stone was left unturned” in the investigation. An acquaintance of Redwine planned to organize a community search next month on Middle Mountain, but Smith said the search is not necessary at this time. Smith and Champagne shared few specifics about the case, both citing the need to preserve the integrity of the investigation. They declined to answer questions about possible motives, cause of death, whether they recovered any weapons that may have been used, whether previous grand juries were empaneled to hear the evidence, and the nature of “compromising pictures” of Redwine. Champagne did say the photos “are certainly a point of contention between Dylan and his father,” which is why it was included in the indictment. “We think it’s an important part of the case and an important part of the probable cause analysis that supports the charges,” he said. The officials addressed a room full of media organizations, in addition to Dylan’s mother, several friends and community supporters. At least 10 television cameras were set up in the La Plata County Administration Building. Champagne said the case has generated “great interest in our community,” but despite the high profile, he hopes to hold a trial locally. Officials held the news conference to update residents about recent developments and to be transparent, he said. “This is the most efficient and effective way to share the information that we need to send to the community while still protecting and balancing the integrity of the case and (Redwine’s) ability to get a fair trial,” Champagne said. Redwine is being held on $1 million cash-only bail in a Washington detention center. He is scheduled for an extradition hearing Aug. 17, at which time Redwine will waive or contest extradition to Colorado. Dylan, who was living with his mother in Colorado Springs, arrived in Durango on Nov. 18, 2012, for a court-ordered visit with his father. Video surveillance from the Durango-La Plata County Airport and Walmart in Durango show little to no interaction between Dylan and his father. After a stop at McDonald’s, Redwine drove his son to his house near Vallecito Reservoir. Dylan was not seen or heard from after that night. His disappearance set off a massive, multi-day search. Some of Dylan’s remains were found on June 27, 2013, up Middle Mountain Road, about eight miles from Redwine’s home. Hikers found his skull on Nov. 1, 2015, about 1½ miles from the previous remains. The skull had what appeared to be small knife marks, according to the four-page indictment. During Tuesday’s news conference, Sheriff Smith said investigators did not tell Mark Redwine they had recovered Dylan’s skull, and he doesn’t know if Redwine has learned about the skull. District Attorney Christian Champagne explained a few legal procedures being used in the criminal case against Mark Redwine. Bail is money jail inmates post with the court to ensure their future attendance. If defendants attend all of their court hearings, their bail money is returned. “It’s basically like making sure you have a stake in the game and that you don’t run,” Champagne said. In most cases, defendants can post bail through a bail bondsman, in which defendants pay 15 percent of the bail and the bondsman covers the rest. Mark Redwine is being held on a cash-only bail, meaning he’s not allowed to go through a bail bondsman and must put up the full amount himself. What is an extradition and how does it work? Extradition is an agreement among states to transfer prisoners across state lines. “When a fugitive from one state is found in another state, it’s the agreement that allows the states to transfer that person to where they’re wanted for the crime,” Champagne said. If defendants contest extradition, prosecutors must prove the person being detained is the person who is wanted in another state. They can do this through photographs, Social Security numbers, fingerprints and other methods. States also must show “probable cause” that a crime was committed. 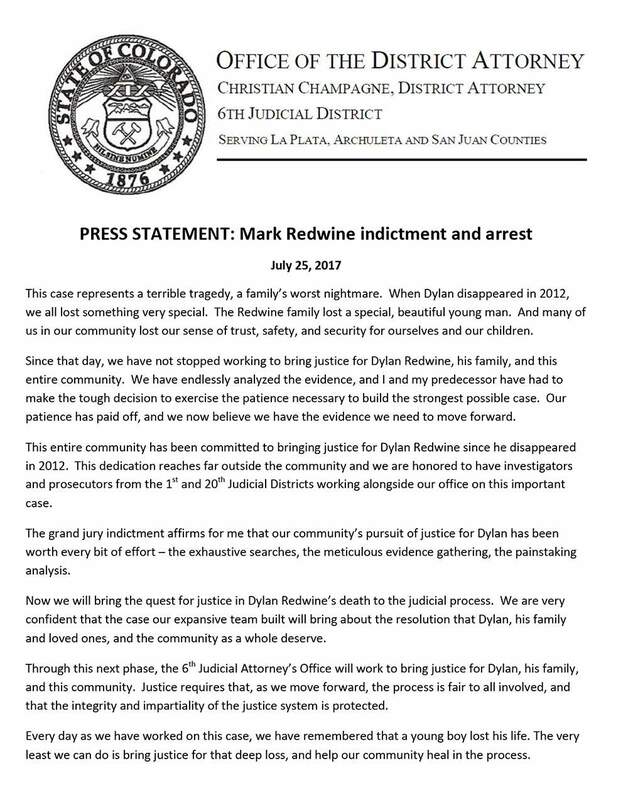 What happens if Mark Redwine contests extradition? Mark Redwine will have a hearing in which prosecutors must prove his identity and show he is likely connected to a crime in Colorado. A grand jury is a group of 12 citizens who are asked to determine whether probable cause exits in a criminal case presented to them.